Remember in school when the whole class would lose their mind if the teacher so much as wheeled a TV and VCR into class? Well, thanks to a free update due next year, the young people will be having their minds molded by Assassin's Creed Origins' new Discovery Tour mode. Murder simulator Assassin's Creed has always had serious historical chops, using actual book smarts to give its various historical narratives extra authenticity, but this takes it to the next level. The update will give teachers - and you - the option to remove combat and quests from the whole game world, meaning they can safely show kids around ancient Egypt without getting shanked. More than that, there are specially created guided tours and information and images from IRL museums too. There’s even an estimate of how long the tour will take to make sure you’re never too busy for a quick eyeball around some canopic jars. Jean Guesdon, the creative director for Assassin's Creed Origins, explained that Ubisoft created the mode after receiving feedback from teachers about the game's historical content. The feedback was probably something like "we love the nerdy bits, but could there be less stabbing?" They already an encyclopedia's worth of reference material to hand, and Minecraft has already proved that games in the classroom can keep students, teachers and parents happy, so it feels like a win win. 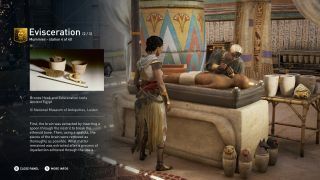 "It’s a dream come true for us to offer Discovery Tour by Assassin’s Creed: Ancient Egypt, an educational mode built specifically for people to learn more about the incredible history of Ancient Egypt through the interactive experience made possible via a video game," says Guesdon. And to think, when I was growing up we got genuinely excited if the teacher let us have a play of Encarta Mind Maze. Assassin’s Creed Origins will be released on October 27.